How do archaeologists find sites? Upon further reflection I realized that the link between digging a square hole in the ground and, say, reconstructing the origins of agriculture, isn’t always inherently clear. For those of you who share his concerns, I’m starting a new series of posts called HDAKA3 (or “How do Archaeologists Know Anything About Anything“). And as an archaeologist, one of the recurring questions I get asked is how archaeologists find sites. It’s a reasonable concern. If you associate archaeology with the process of excavation, it’s not immediately apparent how we discover areas of human activity buried by hundreds to thousands of years of sediment. In order to solve this problem, archaeologists rely upon a variety of overlapping strategies. I’ll break these down one by one. In simplest terms, survey entails walking across a landscape and looking for artifacts. Generally, survey works best in areas without abundant vegetation, like deserts and ploughed fields. If you’re on a survey project, you spend most of your time walking with your head down, and there’s a high probability that the back of your neck will get sunburned. The general rule of thumb is that areas with a large number of artifacts are good targets for future excavation, while areas with a small number of artifacts are thought to reflect a lack of past human activity. 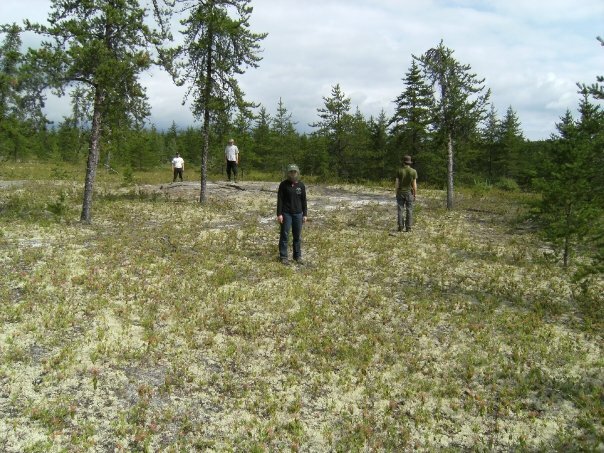 Showing elevation change by standing on a possible feature during a McGill survey in Northern Quebec – Summer 2009. Survey can also involve digging small test pits, especially in areas where surface survey is impossible due to vegetation. Test pits are small-scale excavations designed to get a sense of the number of artifacts below the ground surface. I’ve dug small 50×50 test pits the simple way in northern Michigan: you hop on the head of a shovel, pull out the blade and place it perpendicular to the first cut, and then repeat the process until you’ve chunked out a square. All of this dirt is dumped into a bucket and screened for artifacts. A whole line of these small test pits can tell you a lot about where concentrations of artifacts are located. 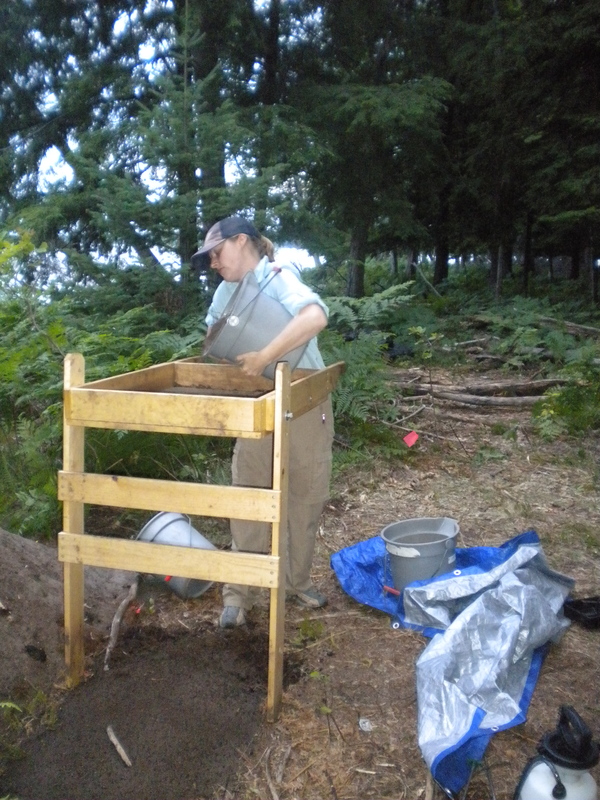 Fiercely productive archaeologist Ashley Schubert screens a bucket, while hunting for artifacts in northern Michigan – Summer 2010. There are a number of different strategies for conducting surveys – you can sample randomly within a given area of land, you can sample along transects like an ecologist, or you can conduct a targeted survey of the places you’d most expect to find sites given the regional record. Archaeologists generally taken into account the amount of work done in the area before, and what sorts of questions they want to answer over the course of their project when making these decisions. Survey, Azraq Jordan – Summer 2008. Survey is also useful because it can tell you where people were living at different points in the past. 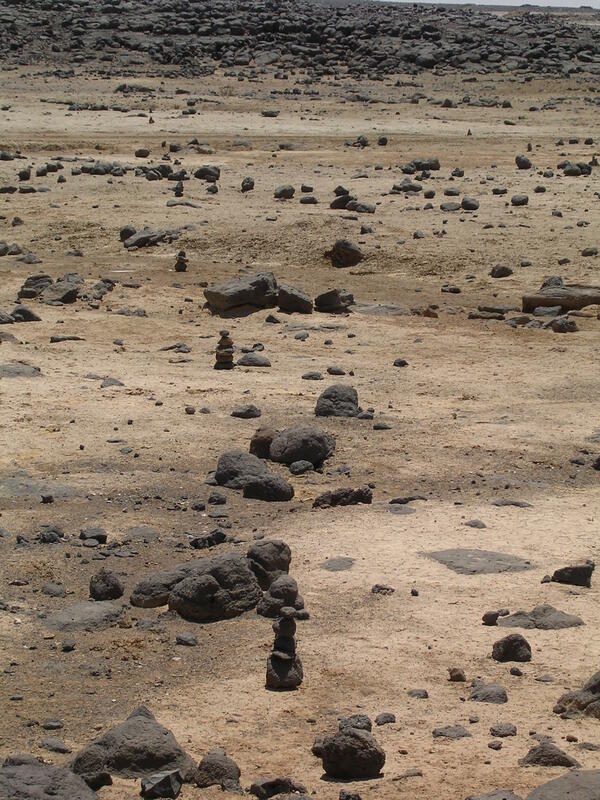 The photo above shows a line of stone ducks that I built when I worked on a survey project in Jordan in 2008. We were using the rocks as a way to keep a straight line when mapping the surface of the ground and spacing ourselves out to collect artifacts. One of the key goals of this survey was to collect stone tools from different periods, in order to figure out how people used the landscape differently over time. For example, were people clustered near lakes during the early Palaeolithic, but dispersed farther afield in the middle Palaeolithic? In addition to helping you find sites, survey can also shed light on the answers to these kinds of questions. 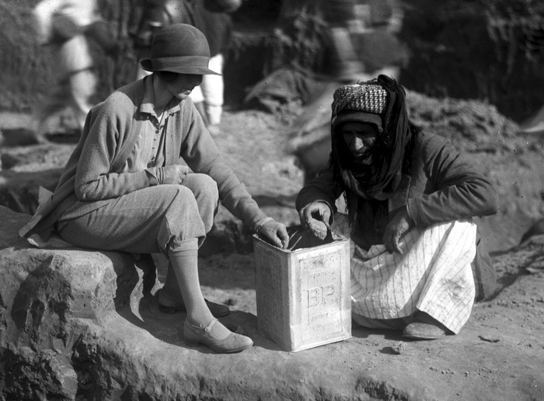 Katharine Woolley and Sheikh Hamoudi Ibn Ibrahim during excavations at Ur, 1928-1929. Now if you’ve noticed that early archaeology fails the Bechdel test, points for perceptiveness. However, while females have been largely excluded from foundational archaeological narratives, the team at Trowelblazers is working to uncover the often significant disciplinary contributions made by women that have been left out of popular narratives. If you’re interested in the history of archaeology as a discipline, their site is well worth a visit. Gendered narratives aside, there are two important things about the antiquarians who explored the prehistoric record before archaeology coalesced as a discipline: (1) they were obsessive enough that they tended to dig at more than one site, and (2) many of them left behind detailed records and maps of their findings. 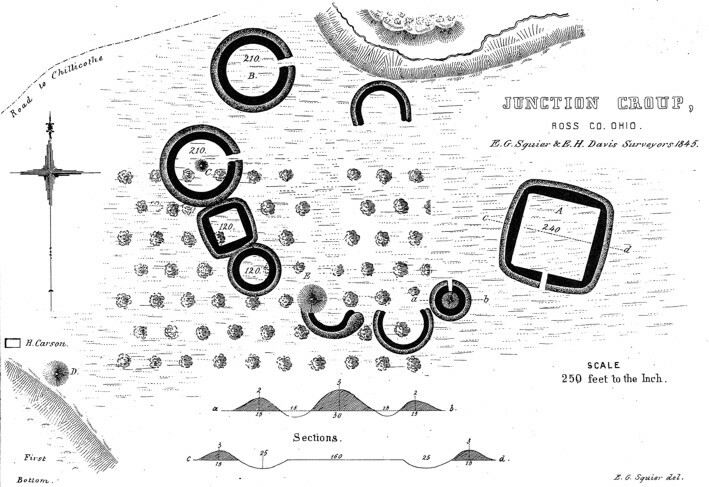 Squier and Davis map of Junction Mound group…from 1848. The important thing about this history is that their archived maps and records can often provide a jumping off point for further exploration and excavation. Archaeologists never simply parachute into a region, shovel in hand, and start digging willy-nilly. There’s a significant amount of research ground work that goes into selecting a site, and much of it involves familiarizing yourself with the history of archaeological work that has been conducted in the area before. Remember the opening Badlands scene in Jurassic Park, where the nerdy, beleaguered techie (who I’m assuming was a grad student) shoots radar into the ground and produces a picture-perfect TV image of a velociraptor skeleton? The cool thing is that we have that technology now! Well, kind of. Geophysics is a branch of survey becoming more and more popular in archaeology, because it uses different types of instruments to investigate features below the ground surface. However, it rarely produces picture-perfect TV images like that of the velociraptor skeleton. And the line about how “in a few years we won’t even have to dig anymore” doesn’t really ring true for archaeology, because most geophysical data are a little ambiguous, to the extent that they need to be “ground-truthed” through further survey and targeted excavation before rigorous conclusions are drawn about the layout of a site. Two of the most common types of geophysical survey are magneometry and ground penetrating radar. Magnetometry measures patterns of magnetism in the soil by using an instrument called a magnetometer. The instrument is moved along the survey area following an organized grid, and the resulting data are used to produce maps of what the terrain looks like up to two meters below the surface. Human activity like burning or digging alters the magnetic reading of the soil, producing higher or lower signals that show up clearly against the natural backdrop. A magnetometry map of the Junction Mound group. If you compare it to Squier and Davis’ map from 1848, you’ll notice that the mag data reveal details of the earthworks that weren’t spotted by initial surveys. Another popular technique is ground penetrating radar. This technology emits bursts of…radar….that….penetrate the ground. Clearly geophysical specialists are just as creative as anatomists when it comes to developing new names. Despite its lacklustre title, ground penetrating radar is extremely useful for archaeologists because it is another type of non-invasive technology that can map out differences in soil composition and identify features, without touching a soil to the dirt. Its basic operating principle is grounded upon the fact that different types of materials – archaeological features, stratigraphy, bedrock – have distinct physical and chemical properties that produce quantitative differences in energy transmission and reflection measured by the radar. Not all sites are great candidates for magnetometry – in particular, areas with high amounts of modern activity (e.g. metal fences), or sites where past activity doesn’t produce a marked pattern of magnetic contrast – are scenarios where magnetometry surveys don’t produce clear results. Accordingly, archaeologists often conduct preliminary magnetic susceptibility surveys before committing to such techniques. During my brief forays into southeastern archaeology, I’ve spent time working magnetic susceptibility surveys in North Carolina. It’s a lot easier than dealing with a real magnetometer. Instead of carrying or pushing a machine along the ground surface,, you basically just walk along a grid poking a stick into the ground, jotting down the readings as you go. Despite my distractible nature and propensity to veer off course to pet visiting dogs, even I can do that. Resistivity survey is an additional geophysical technique that can be informative about areas of past activity, as it measures – you guessed it – soil resistance to electrical current. This particular technique can identify potential areas of past human activity – both less compact soil (as in the case of ditches or pits) and more compact soil (as in the case of structure floors) have distinct signatures that can give archaeologists an idea of where they are most likely to find features. If you want to SOUND like an archaeologist, use the terms “geophys”, “mag” and “GPR”to describe these technologies. 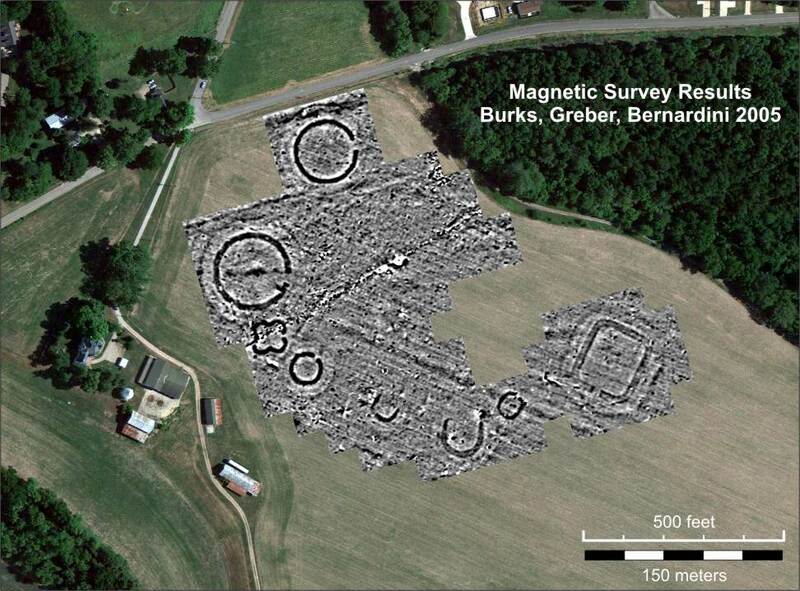 Finally, archaeologists have also begun using remote sensing to locate potential sites. While geophys allows archaeologists to do archaeology without digging, remote sensing takes things a step further: it allows archaeologists to do archaeology without even leaving the house! The basic principle underlying remote sensing is that certain features that aren’t visible from the ground surface are visible from the air. Examining aerial photographs, for instance, is one way that archaeologists identify potential sites, as features that aren’t appreciable when you’re walking around a landscape are often clearly apparent when viewed from the air (think about, for example, the Nazca Lines in Peru). Higher tech strategies like Light Detection And Ranging (or LIDAR) use airborne lasers fired at the ground surface in order to build three dimensional maps of the landscape. Importantly, LIDAR can also penetrate vegetation (though some of the beams will bounce off tree tops or branches, so the resultant data require some calibration), making it possible to map sites in thickly wooded areas, like the dense jungle landscapes that are home to many Maya centres. At this point, you’ve no doubt gleaned that archaeologists have a range of clever strategies for figuring out where sites are most likely to be found. Another way to locate sites efficiently is to take some of that data – be it from survey, archival research, geophys or remote sensing – and plug it into GIS. 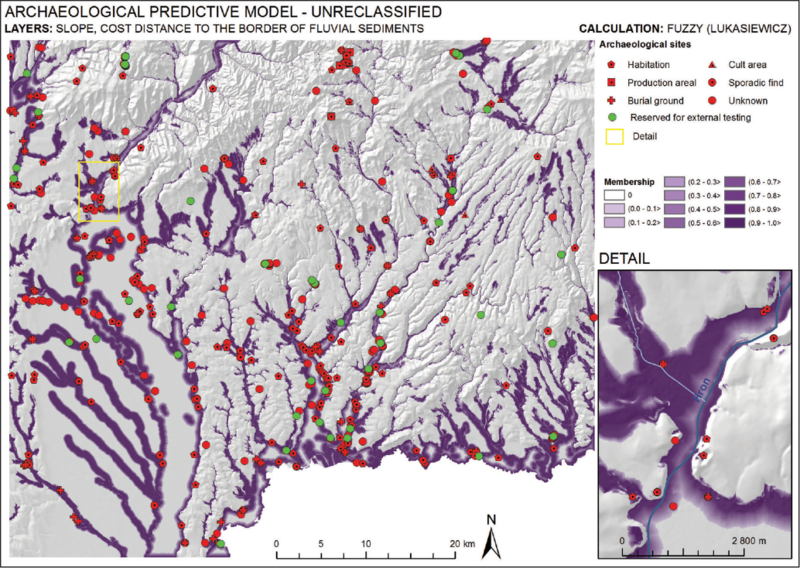 GIS stands for Geographical Information Systems, and is basically a fancy term for maps that contain both locational information and other additional data. If you have census information and GIS software, you can make maps showing the geographical patterning of variables like income, language, and even access to supermarkets. While GIS has a famously steep learning curve, it’s still a tool that many archaeologists rely upon heavily. So if you’re looking for Copper Age villages in Spain, and previous archaeological research has shown that people tend to live within 20 kilometers of other villages, favouring locations along waterways or high on hilltops, you can plug all of that information into GIS. Adding data on elevation, streams, previously discovered sites from the same time period and setting some parameters (e.g. highlight all areas ≤ 20km from known sites either (i) 1000 meters), can produce a very handy map of the best places to explore when you’re conducting survey. This is not actually from Copper Age Spain, but you get the general idea. Some of the greatest contributions to our knowledge of prehistoric France have been made by children wandering into caves while chasing dogs. Metal detector enthusiasts occasionally stumble onto massive Anglo-Saxon hoards. A pair of German hikers discovered Ötzi, the famous 5,000 year old mummy, while traipsing along mountain peaks in Italy. Farmers have a habit of noting strange artifacts that erode out of their fields – or, you know, using them as doorstops . 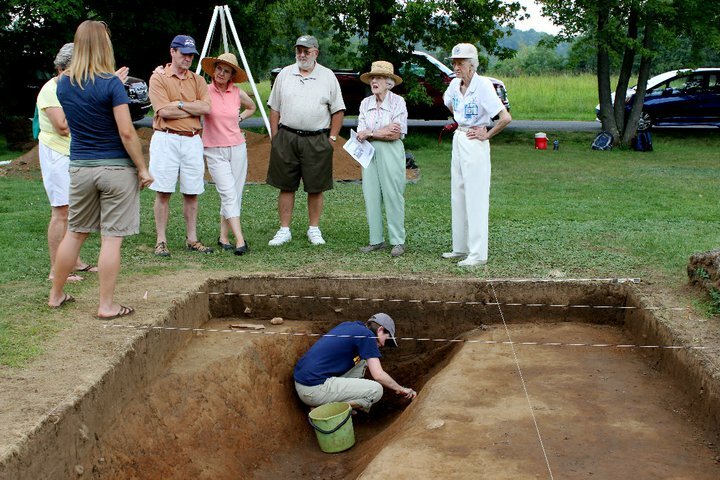 Dr. Alice Wright talks to locals in Haywood County NC, while I play in the dirt – Summer 2011. The point of all of this is that locals often curate a significant amount of information about archaeology, sometimes without even realizing it. For example, Bolores, a site I’ve worked on in Portugal, was discovered when a farmer noticed concentrations of artifacts and bones eroding out of a ridgeline that ran along the border of his fields. It has since been the focus of multiple seasons of excavations that have taught us a significant amount about Late Prehistoric mortuary rituals. Accordingly, actually talking to people about what they know about their local landscapes can be an extremely productive strategy. I’ve met archaeologists who advise making a deliberate stop at the local watering hole whenever starting a new project, so as to cultivate good will by buying a few rounds and asking people whether they’ve seen any funny-looking pottery sherds lately. Public archaeology days, like the one pictured above at Alice Wright’s site of Garden Greek in 2011, are also a great way to mingle with local folk. In which I talk to locals at Garden Creek. The small children behind me were arguing about how we got our trench walls so straight – their eventual conclusion was “machines”. And there you have it – a set of five different strategies that archaeologists use to locate sites. Have a great weekend, and please, if you do find a beautifully preserved Bronze Age dagger, resist the urge to use it as a door stop. UPDATE: I hunch over my computer corrected. 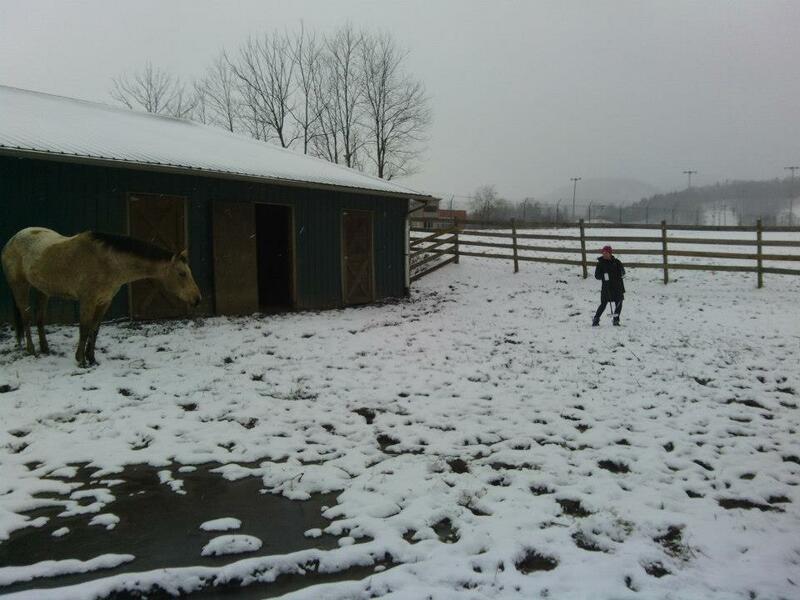 The ever astute Professor Alice Wright pointed out that I initially identified the technique being used in the North Carolina horse paddock as resistivity, when it was in fact magnetic susceptibility. This error has since been corrected. One thousand profound apologies to any geophys nerds who saw the uncorrected version. Image Credits: Photo from northern Quebec survey courtesy of Jennifer Bracewell (McGill). Photos from Garden Creek site courtesy of Alice Wright (App State). Harrison Ford gif found here. Squier & Davis map of Junction Mound group found at Earthworks Conservancy, here. Junction Mound mag map also found at Earthworks Conservancy (it’s like they’re obsessed with earthworks, or something), here. Sample predictive model map from Lieskovský et al. 2013, here. Quotation Credits: Carter’s journal quote found at Eyewitness to History website, here. This entry was posted in Anthropology, Archaeology, HDAKA3 and tagged anthropology, archaeology, finding archaeological sites, How do archaeologists know anything about anything?, survey. Bookmark the permalink. 8 Responses to How do archaeologists find sites? That Jurassic Park scene prompted years of me digging holes in my backyard and cleaning dirt off of rocks with old paintbrushes, pretending they were fossils. As usual, I enjoy reading your posts! Jennifer – growing up I never wanted to be a palaeontologist – instead I was obsessed with becoming a wildlife biologist (you can see how well that turned out). 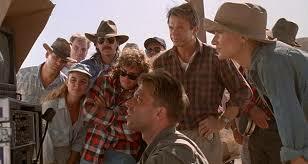 I think I love Jurassic Park so much today because it melds the study of bones and behavior together neatly. Also, velociraptors. I found your website as I was conducting research for an anatomy course I was writing. (I’m a physical therapist/freelance writer). I like to use quotes from archeology sites that discuss the bones and how to side them. I just had to comment on this post because I find your writing scholarly and charmingly humorous at the same time. You obviously have a passion for your craft and I find that very inspiring. I can’t wait to share what I learned in this post with my kiddos. We have a few science-minded little ones here! Thanks Polly, I’m so glad you enjoy the site! Let me know if your students have any specific questions about the material – if you post them in a comment I can answer them in the thread, or possibly even put up a new post! Thank you very much for your all this information about archaeological site discovery you wrote. I hope a lot of things will you write about the hidden story of archaeology. Thanks Gidey! Soon I’ll be writing about a short fieldwork trip I just made to Romania, trying to get a new project off the ground, so there is more archaeology to come in the near future.